There is a myth that eating cheap equals ramen noodles and macaroni, but I’m here to tell you that it simply isn’t true. Each family’s definition of a small budget is going to differ depending on location, size of family and other determining factors. According to the USDA, a family of four with children aged 2-4 is considered thrifty to live on $131 per week. Considering that this number is for food only and doesn’t include things like diapers, toilet paper and other toiletries, I feel that most people should be able to fall within this range if they put enough effort into it, unless maybe they live in a high cost of living area or have family members with a special needs diet. Each family’s budget and resources will look different, but there are some things that anyone can do to feed their family well with less. I personally try to spend $75-100 per week to feed a family of four with two small children including household items and I find in my area (Arkansas) it’s fairly easy to do. In fact, I know if I tried harder I could get that number down even lower, but at the moment I’m comfortable with what I’m spending. 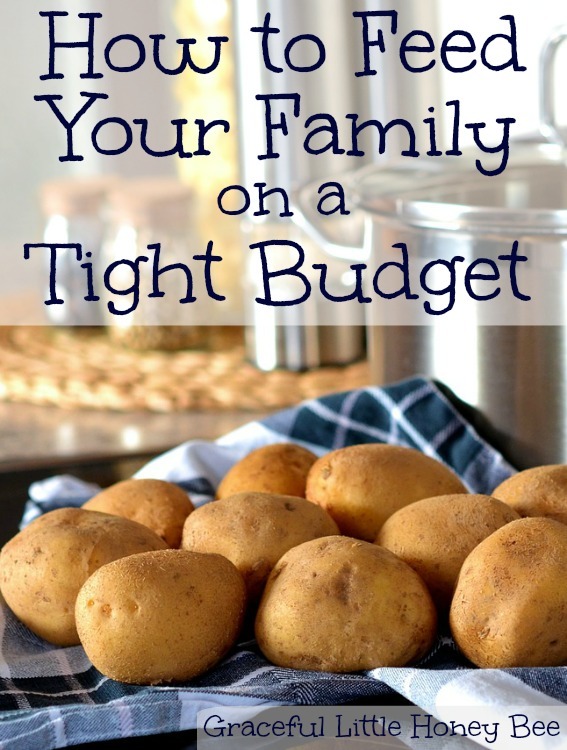 So here is my guide for How to Feed Your Family on a Tight Budget. If you’re on a limited budget, you’re going to have to eat meals at home simply because it costs way less than eating out. Did you know that the average American family spends over $200 per month eating out? Just think how much you would save by doing this one thing. If you think ditching the drive-thru will be hard to break then check out these tips to avoid eating out that are sure to help you stay within your budget. Also, check out this list of copycat recipes to learn how to make your favorite restaurant items at home! Taking the time to plan your meals for the week is a great way to save money when implemented correctly. To get the most bang for your buck, you will need to plan meals around what’s already in your pantry and then around what’s on sale or in season. Menu planning won’t save you money, however if you buy steaks, out of season produce and other expensive items all the time. If you need help in this area go here for a step-by-step guide to planning your meals. Convenience food has its place, but shouldn’t be relied upon all the time when you’re on a tight budget because it costs more and is usually unhealthy. Anything that you can learn to make at home instead of buying will save you money. I make things like freezer meals, homemade bread, granola bars, ranch seasoning and taco seasoning because they’re better for my family and save me money. Check out this list of 30 Items You Can Make at Home to Save Money for tons of cooking from scratch inspiration. I’m a big fan of keeping my life simple, including my meals. I think people overspend on food simply because there are too many options to choose from. Sticking to the basics and eating a simple diet will definitely save you money and also help to make your life a little easier. Check out my list of 35 Frugal Foods to Buy When You’re Broke to see what you should be buying to get the most from your money. Also see my list of 30 Frugal Meal Ideas for When You’re Broke to learn how to create meals around those frugal foods. People that don’t eat leftover really baffle me because I feel like they must be wasting so much! I specifically cook more than we need so that we have enough for another meal. In fact, we love leftovers so much that we eat them almost everyday for lunch. This saves me the time and hassle of having to plan/cook for lunches and also saves money. Leftovers work well for us because we have small children, but if you have a large family or teenage boys then leftovers may not work quite as well for your family. If you’ve read my blog for long then you probably know by now that I think everyone should grow something even if it’s just a basil plant on your windowsill or a tomato plant on your back patio. Anything that you grow on your own will save you money and connect you to your food which our country needs in a bad way. We grow a large garden and rarely have to buy produce through the summer months. If you aren’t already growing your own food then I would highly encourage you to start. Check out these 5 Tips for the Beginner Gardener to learn more. A great way to get the most from your grocery money is to stock up when something is on sale. To do this well, you will need to familiarize yourself with standard prices of different items in your area. Then when an item goes below that price you should consider buying enough to last until the next sale, especially if you have a coupon to match with the sale. Things go on sale in cycles such as baking supplies around the holidays and grilling items in the spring/summer. For example, around Easter I bought 10+ lbs of butter because Aldi had it on sale for $1.89 per lb which is a great deal considering it’s normally priced around $4 per pound. Butter freezes well so now I have enough to last me for a long time. Also, don’t be afraid to stock up on things like bell peppers, onions, etc. since they can be chopped and frozen for when you need them using this method. Another great money saving tip is to download the IBOTTA app and start earning cash back on your grocery purchases. You even get an extra $1 when you submit your first rebate! Which of these do you think would save you the most? Do you do any of them already? I’d love to know! I love, love, love these tips! The one thing that always throws off our grocery budget is not eating simply. I love to make new meals, and if I find one that I want to make I will often buy the ingredients regardless of price. But the past year or so I've been doing so much better in that department. Now we eat very simply and I make things I never thought of eating before mainly because they are much cheaper. Awesome! I try to keep it simple, but will try new things every couple of weeks so it doesn't get too boring. These are such great ideas! I also love your suggestion to freeze butter -- I never would have thought of that! Yes butter does freeze well, I stock up when it is on sale, the same with milk. One of our local stores here in Oregon just had butter @ 2.50 lb. and milk for 99 cents a gallon, I buy lots of milk to make yogurt. I love your site. Awesome prices! I've never tried freezing milk. Thank you for sharing! I love all these tips. One thing I NEED to do is start my own garden. I've thought about it for years but I'm really intimidated by it! Wow, great tips!! I have implemented most of these and they have saved me a ton of money! Always have wanted to grow my own so maybe its time! You can also save the peelings and end pieces of carrots, onions, and potatoes to make a rich vegetable broth. It tastes better than store bought, it doesn't have the chemical additives, and it's free. A great list of tips, Missy! I think for me the stocking up and eating at home/cooking from scratch are what save me the most. But really, they all help immensely. appreciate the article. We live on an extremely tight budget due to the fact that my husband is the pastor of a small church plant. We are a family of six, ages ranging from 1-9. Our grocery budget is $50 a week including toiletries. So basically $200. We are debt free in all other areas but live on a very small salary. So yes, If we can live on $50 a week for food, ANYONE can eat well on a low budget.! Wow Jenn, that's impressive. Sounds like you could teach us all a lesson in this. Thanks for sharing! Cheese also freezes well. Hard cheese will best be suited to grating after frozen. We also invested in a vacuum sealer and the attachments for wide mouth and regular canning jars. Vacuum seal all my chocolate chips, nuts, dried fruits etc in jars. They keep much longer that way on the shelves. I also buy my spices in bulk and freeze or vacuum seal them. They last a loooong time in the freezer and much longer in vacuum sealed jars. This way I fill smaller containers from my stored spices. Wonderful article on Pinterest. The suggestions are spot on. Gardening is a great way to save money on groceries. Even though I only have a small yard, I have found space for a raised garden. It's only 8'x10', but I'm able to have several tomato, squash and zucchini plants along with snow peas - grown up the chicken wire fence that keeps the rabbits out of my precious veggies. I also grow potatoes in 5-gallon pails on the deck and a few peppers in pots along the side of the garage. My mom and a few friends have larger gardens. A few years ago we started sharing our extra veggies. Most of the women in this group are over retirement age and I believe that they never figured out that they aren't growing food for a large family any longer. After each has canned or frozen all the veggies they want or need - any extras are offered to the others. This past summer I was given a 5-gallon pail full of assorted bell peppers, a ton of tomatoes (my mom even canned them for me), 20# of potatoes, several large winter squash, a big bag of onions and and a box of carrots. Even with my small garden, I was able to share a few boxes full of zucchini and spaghetti squash. Our network of gardens works great since we can always find someone that is very appreciative to have some fresh produce. Thank you! I love these tips, especially the reminder that eating out can cost you over $200 a month. A lot of times I am really tempted to grab something on the way home, now I am going to remind myself that I could be saving that money instead. I really love to clean out my pantry every other month or so, towards the end of the month, I start making meals based on just what I have (tonight we had noodles with broccoli and cream of mushroom soup, it was great!) I love doing this because I don't spend any money and it makes me get creative with what I have. We have had some weird meals, but for the most part they turn out well. Thank you for sharing! This is a great post and super helpful to me, as a mom of 3! Thanks! Recently joined Ibotta, they are now offering a $10 free bonus for joining!! Love the App!! My mom always bought butter on sale and then froze it. Sadly, we got away from eating frugally for a while when I became disabled. It's taken me some time to really get back in the kitchen but I'm in the process of figuring out how to work with my disability instead of against it. Great post! Great tips! I'm sure these will help alot. Thanks alot for your time and effort you pur in this project. What about feeding a family of 10. 2 adults and 8 children ages ranging from 3-17 on a $100 a week budget. This budget also included things like laundry soap, toothpaste, toilet paper, medicine, socks. Etc. A family of four on that amount would be heaven.